Hi all. This is my beast, its a 1999 XS 1.8 16v, when i bought it, the car was on its last legs and looked very sorry for itself. Removed all S**t stickers and racing stripes from it. G3,G10 the bodywork. Removed the luminous green hand painted muck off the alloys. 2nd hand race exhaust, replacing the botched on 106 exhaust ??? bodywork looks reeaaaally tidy...is that just a good pic?! Mine was on a V too! Disclaimer: The above is not to be taken to heart and is probably a joke, grow up you big girl. After masses of elbow grease the bodywork is in very good condition for its year, i was surprised how well it came up, it has a few knocks and scrapes on it but then it is a 14 year old car. It has had a lot of money spent on it at some point, it has been professionally de locked and came with a huge wadge of previous bills mots, including the original sale invoice. I want to keep the outside stock as i love the shape of the 306, but want to do a crazy engine conversion with somthing around the 200bhp mark, but not sure yet which route to take, i will post more pics as i go. Looking awesome man! Great progress, you certainly don't hang around! Been doing lots of PJ's and selling off crap i don't need. For funding. Once its finished i am hoping to take it to a few shows and raise a few eyebrows. Looking to keep the outside stock bar a different rear spoiler. Don't know weather to keep the cyclones or get some 206 gti 180 alloys. I have also looked at using some Sierra Sapphire Cosworth bonnet vents. It will look subtle. I am so excited about this project as i can actually afford to drive it once its finished. what plans for the gti6 engine?? are your lights not twin optic already?!! many still fit them with clips bust. quite common. cable tie ftw!! The other option i was considering was to keep it N/A and use the GTI 6 head with the 1.8 bottom end. This is the cheaper option. I did look at supercharging, but at 1500 for a supercharger alone and then another 1500 on top of that for the conversion kit, that option soon went out the window. The DP Kit is 1800 odd, the pistons from wassner another 500, this seems the cheaper option. Not sure if to keep the standard cams or go for a set of kent sport cams. I would prefer the turbo route as i have always wanted a turbo car. Will try the cable ties on the headlamps lol. Some more of the engine strip down. Tolerances are looking good. The block is now painted. More to follow, cash flow has run dry now, anybody need any PJ's doing???? Wow, great progress there fella. Going really quick! What plans do you have for the engine? Uprating anything, or just an overhaul? That really is a cracking project, and if you could get all those plans in place, will be an awesome build. I, one day far far away, am aiming to SC a Xu7JP4/XU10J4RS hybrid. Such potential, and proven by the 205 boys to provide great results. I dont want to go to mad as i want it to be reliable. I think 260 is about right as any more then i think i will run into traction problems, although with the set up i am planning 300 is achievable. I do have a score to settle against a corsa vxr lol. 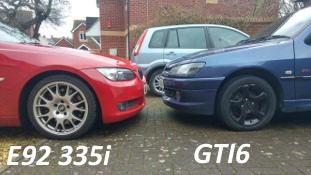 I am very tempted with the XU7/XU10 RS mix, a mate of mine has done it in his race 205, but he seems to think because the 306 is a heavier car it would not be as good. Personally i want a turbo 306, when i was a apprentice i use to work next door to G Tech Motorsport, most of my Saturdays after work were spent just watching and learning from the chief technician there. Their rallycross 306 is the ultimate 306. 500 BHP and 4WD total monster of a car. Would love to have that as a road car. After much though i am going to go for a XU7/XU10 Hybrid mix. The Turbo idea is great but it will take me till next centuary to save up. So i am looking at using my gti6 head with the engine management system and my 1.8 bottom end with the alloy gti 6 sump. Just make sure you get it mapped up, otherwise it'll overfuel pretty badly! (16-09-2013, 03:39 PM)Midnightclub Wrote: Just make sure you get it mapped up, otherwise it'll overfuel pretty badly! Got the rest of the front end off today, discovered the bottom hose connection had sprung a leak at the join due to corrosion, so new bottom hose needed now. Current time: 25-04-2019, 04:54 PM Powered By MyBB, © 2002-2019 MyBB Group.